I?m a believer. I remained skeptical for years as Toyota executives vowed their company would become a design leader. No more. The 2018 Lexus LC 500 coupe (I give it three out of four stars) is a triumph, a gorgeous car that elevates its whole brand. Taken alongside the newly styling 2018 Toyota Camry that goes on sale later this year, it establishes Toyota?s designers as a group to watch. The LC 500 coupe isn?t just the best-looking Lexus ever, it?s a design Porsche or Ferrari would be proud to claim. Flawlessly detailed and beautifully proportioned, the LC?s smooth shape appears to have been poured from molten metal rather than built with wrenches and robots. But for all its beauty, don?t mistake the LC for a sports car. It?s a grand tourer in the European tradition of cars built to look good and carry a wealthy few in stately opulence. It?s fast on the highway, but not an incitement to sporting detours onto twisting country roads. The LC is almost unique among modern luxury coupes its size. Most of them offer more power and sharper handling for bragging rights, despite their drivers? probably indifference to boy-racer specs. A less attractive car might not get away with that, but the LC pulls it off. At least in its early days on the road when few people have ever seen one, the LC literally stops pedestrians in their tracks and causes drivers of other luxury cars to slow for a long look and an approving nod. LC 500 prices start at $92,000 for one with a 471-horsepower 5.0-liter V-8 engine and 10-speed automatic transmission. 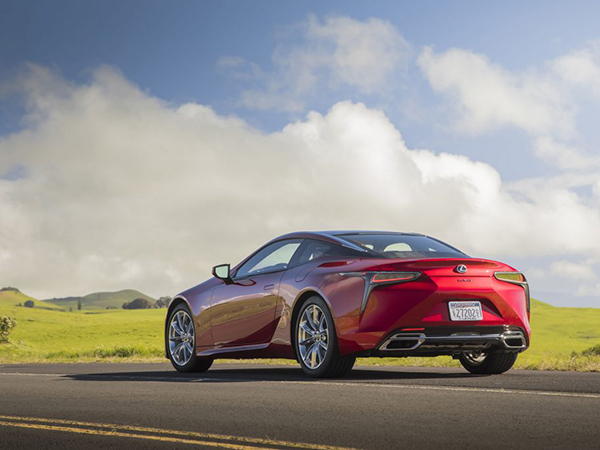 The LC 500h hybrid model has a 3.5-liter V-6 engine and electric motor for 354 total horsepower, significantly better fuel economy and a $96,510 base price. There?s no F-Sport package yet, but it wouldn?t be a surprise if Lexus adds one with a few boy racer frills and perhaps a performance upgrade. I tested a well-optioned LC 500 that had the optional carbon fiber trim package, precollision alert and braking, pedestrian detection, adaptive cruise control, lane-keeping assist, forged aluminum wheels, Torsen limited slip rear differential; Mark Levinson audio; navigation, and more. The LC 500?s competitors include coupes like the Chevrolet Corvette Stingray, Jaguar F-type R AWD, Maserati Gran Turismo Sport, Mercedes SL 550 and Porsche 911 Carrera. The LC?s a bargain compared to most of that group, offering more features for the money than all but the Stingray, which remains a shockingly good value. The LC?s interior is comfortable and accommodating, if you ignore the rear seats. That?s easy to do because they offer virtually no leg or head room, and are not even easy to reach into to stash grocery bags or a briefcase. The trunk is also very small, offering just 5.4 cubic feet, less than all the competitors. The trunk opening is wide, but the compartment is very shallow. I recommend soft-sided luggage, and not much of it. The front seats ? let?s just call them the seats; friends don?t put friends in the back of an LC ? are luxurious and comfortable. After a pair of five-hour road trips, I exited the car as fresh and comfortable as I began. My car?s optional Alcantara seat inserts and headliner looked and felt good. Head, leg and shoulder room are expansive. The interior eschews common trim materials like wood and metal for soft covers nearly everywhere you touch, a distinctive and appealing choice by Lexus?s design team. The LC?s V-8 produces competitive power figures, but the Lexus coupe is hundreds of pounds heavier than most of its competitors. That leads to relatively leisurely acceleration, despite claiming a respectable 0-60 mph time of 4.4 seconds. Response to the accelerator pedal is not linear, initially responding slowly, then coming on in a rush that led me to swing back and forth between slow starts and inadvertent wheel spin at traffic lights. The instrument displays are large and clear, but the control for many audio and navigation commands is poor. In lieu of a touch screen or even the awkward joy stick Lexus used to use, there?s a small touch pad in the center console that?s almost impossible to use in a moving vehicle. Automakers test new control systems exhaustively, so I have no idea how the touch pad passed Lexus?s inspection; it makes operations that should be simple distracting and difficult. The LC?s V-8?s 471 horsepower and 398 pound-feet of torque rank in the middle of the car?s competitive set. Combined that with the LC?s 4,280-pound base curb weight, however, and the result is the worst power to weight ratio in the bunch. The LC?s smooth and precise new 10-speed automatic transmission helps offset that disadvantage, and its excellent programming makes for nearly imperceptible shifts and eliminates the hunting among gears that plagues some transmissions with lots of gears. The LC?s EPA fuel economy rating of 16 mpg in the city, 26 on the highway and 19 combined falls roughly in the middle of its class, matching the Stingray, topping the Gran Turismo Sport and F-Type R AWD, and trailing the SL 550 and base 911 Carrera. The LC has a magical engine note, rumbling and promising endless acceleration and vast power. It?s certain to delight the car?s owners and make up for its unexceptional performance and fuel economy. The 2018 Lexus LC 500 coupe is beautiful, luxurious and rare, and that will be enough for everybody who?s likely to buy it. The LC 500 doesn?t try to match other exclusive coupes? power and performance, and thereby succeeds on its own terms. The touch pad control is a baffling choice, but the LC 500 team made plenty of good ones. The result is a car that raises the bar for the whole brand. It will delight its owners for years to come.